... I finished this piece up about a year ago and thought it would be nice framed and hanging up. The sampler is made up from the "Monthly Animals" by NickysCreations. Stitched on 36ct "Sandpiper" and stitched in my conversion from the charted DMC to WDW. The photo makes the frame a bit more shiny than it really is, I chose it because it is an old gold colour and not too bright. That's about it for today sports fans, thanks again for stopping by, do stop again!! It's the perfect frame! I love it. I am so glad you posted this....I have often wondered about how you've had something framed. To me, choosing a frame is harder than choosing/changing thread color or fabric. AND I am always second guessing whatever I finally decide on. This piece may be my all time favorite of yours. As my little grandbaby says "good job"! Lovely, I like August bee hive, but I am an August baby so . I've to tell you Edgar you made me cray!!!! you're wonderful, your work is just GORGEOUS!!!!! Thank you for stitching it!!! Hugs!!! Fabulous ....both the stitching and framing! It looks fabulous. Way to go on your finish and having it framed. This is fabulous! Mine are still in the to do pile as I am in a panic over the fact they are not all the same size and I don't know how to compensate - what was she thinking?! The frame is perfect. 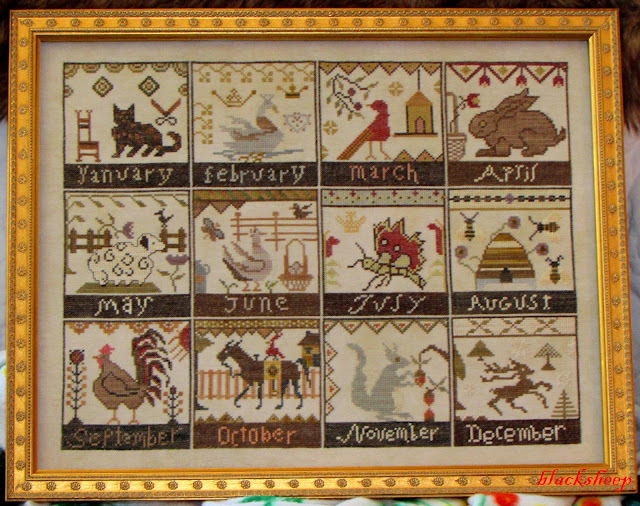 The perfect frame for your stitched piece; it looks really nice! This is fabulous! It's such a fun one. Thanks so much for sharing and for the ongoing joy of your blog! The finished piece looks great. I love the old gold frame. "Old gold" is usually my preference when choosing a gold color. The frame really complements the pattern - looks awesome! I love how it came out! Gorgeous! I absolutely love this! Such an artistic stitch. That frame is perfect for that piece. It is so very pretty. You found the perfect frame for your beautiful stitching. Thanks for showing us!